If you are looking for more Kerala Recipes then do check Vendakka Thoran, Pumpkin Thoran, Beetroot Pachadi, Avial, Vazhakka Thoran, Sharkara Upperi, Banana Chips, Ada Pradhaman, Ela Ada, parippu Curry, Cucumber Kichadi and Ariyunda. 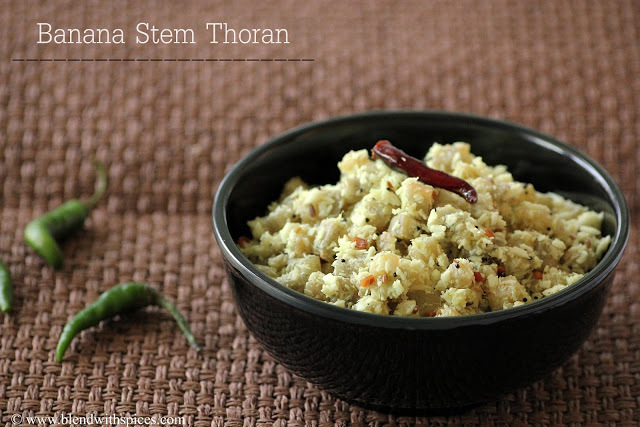 Here’s complete list of Onam Recipes. Chop the banana step into thin discs and remove the fiber. Keep the slices immersed in water mixed with a tablespoon of curd. Chop the slices into small pieces. In a vessel, add the chopped banana stem, salt, turmeric powder and water and cook until the pieces are soft. Drain and set aside. Grind the shallots, green chillies, cumin seeds and coconut into a little coarse paste and set aside. Heat oil in a pan and add the mustard seeds and urad dal and let them splutter. Then add the curry leaves and red chilli to it and fry for a couple of seconds. Now add the ground coconut mixture and fry for a couple of minutes. Add the cooked banana stem and mix. Adjust the salt and fry for 1 -2 minutes.